Home » Facts » Inventions » Places and Travels » Tourism » See the World's Enormous in Size Hammock Which Found In Utah! See the World's Enormous in Size Hammock Which Found In Utah! Utah thrillseekers, invented the scariest yet humongous hammock in the world! Be thrilled of “Mothership Space Net Penthouse” a kind of cradle, invented by Moab Monkeys, a group of thrillseekers in Utah. They required 14,000 ft. of rope to cope with the cradle, shaped-like-pentagon and it gets stretched up to 2,000 sq. ft., and can carry up to fifteen people. The hammock is hung at a height of 400 feet from the rocky Moab Desert. The hammock with steroids comes to reality by the world-renowned brain slackliner Andy Lewis, also known as "Sketchy Andy." 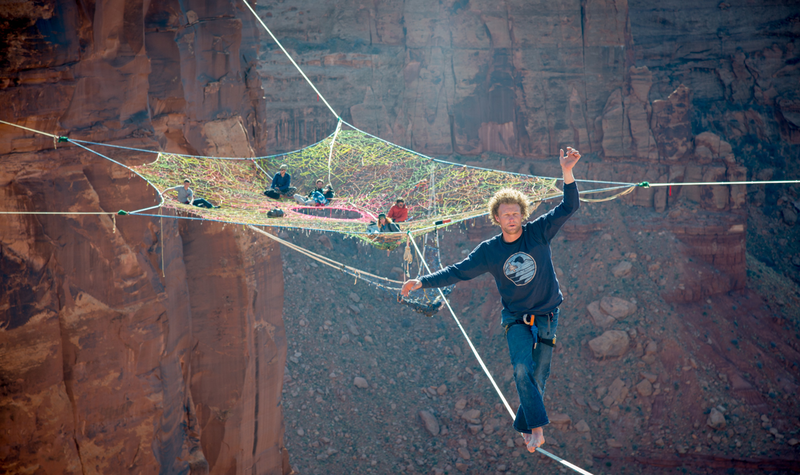 Andy and his thrillseeker friends caught up the cradle by tightrope walking of over 200 feet. They take turns by jumping into the middle of the beddings, onto the desert beneath it. It's pretty impressive, scary and you might urinated when you tried it the first time! So, what do you think guys? Do you want a swing as huge as this? Tell us on the comment below. Thank you for reading See the World's Enormous in Size Hammock Which Found In Utah! posted on the website Kwentology if you want to redistribute this article please include the link as the source. Have some kuwento to share? Contact us!